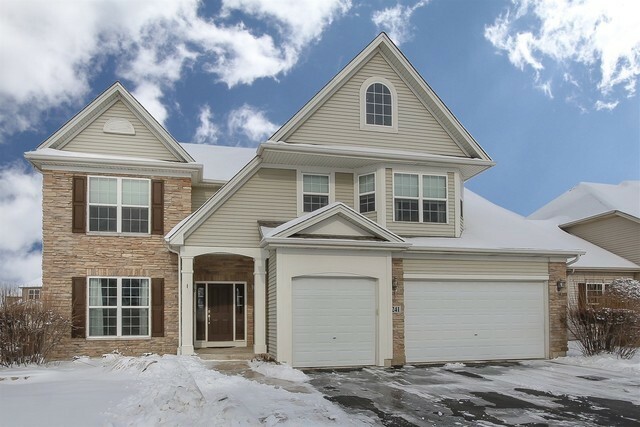 241 Fieldcrest Drive, Bartlett, IL.| MLS# 10266527 | Parade of Homes Bartlett IL, Homes for Sale in Bartlett and the greater Schaumburg area. Listing commissions as low as 1%. Come see this gorgeous/exceptionally well maintained home with loads of upgrades and special features such as a stunning updated eat-in Kitchen w/white cabinets, granite counters, stainless steel appliances, tiled backsplash & brkfst bar, open to large Family Room with dramatic 2 story ceilings and beautiful flr to ceiling brick fireplace! Relaxing Mstr Suite with sitting area, bay window, 10&apos; tray clngs, walk-in + 2nd closet & spa-like Bath with soaking tub, separate glass shower and double bowl sink with granite counters. Outstanding perfectly finished, custom full Bsmnt with great Entertainment Room, stone walls, Bar/Kitchenette area, Office, 5th Bedroom/Work-out rm & loads of strg. You&apos;ll never want to leave the Basement! Other amenities include: hrdwd floors, Dining Room, 9&apos; ceilings, wainscoting & crown molding, can lights thru-out, fabulous Backyard w/Brick Paver Patio & walking Path to front, 3 car Garage & so much more! Sub connects to Forest Preserve w/trails and Kohler Park!